Lentivirus Transduction | Cell Biolabs, Inc.
Lentiviral expression has many advantages over other viruses, including the ability to infect both proliferating and non-proliferating cells. The efficiency of lentivirus infection of target cells, however, tends to be lower. Additives such as Polybrene® can increase transduction efficiencies, but even then only a small fraction of lentiviral vectors can trasduce many target cell lines. Our ViraDuctin™ Lentivirus Transduction Kit provides superior lentiviral transduction efficiencies in a variety of cell lines, even when compared to transductions in the presence of Polybrene®. This system is ideal for many primary cells as well as immobilized cells. *Note: The number of transductions per kit is based on use of a 24-well plate. The kit may also be used with 96-well, 12-well or 6-well plates, as well as 60 mm or 100 mm dishes. Please see product manual for more details. 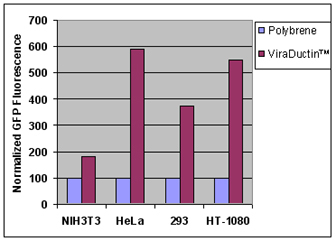 Figure 1: Transduction of 293AD and HT-1080 Cells. 293AD cells (#AD-100) and HT-1080 cells were each seeded at 50,000 cells/well in a 24-well plate overnight. Cells were infected with GFP lentivirus for 48 hours in the presence of no additive (left), Polybrene® (middle), or the ViraDuctin™ Lentivirus Transduction Kit (right). Figure 2: Transduction Efficiencies in Various Cell Lines. NIH3T3 cells, HeLa cells, our own 293AD cells (#AD-100), and HT-1080 cells were each seeded at 50,000 cells/well in a 24-well plate overnight. Cells were infected with GFP lentivirus for 48 hours in the presence of Polybrene® or the ViraDuctin™ Lentivirus Transduction Kit. For each cell line, fluorescence levels using the ViraDuctin™ Lentivirus Kit are depicted relative to a normalized fluorescence level of 100 for transductions with Polybrene®. Fang, X. et al. (2016). IKKα-mediated biogenesis of miR-196a through interaction with Drosha regulates the sensitivity of cancer cells to radiotherapy. Cell Death Differ. doi:10.1038/cdd.2016.32. Osorio, L. A. et al. (2015). SNAIL transcription factor increases the motility and invasive capacity of prostate cancer cells. Mol Med Rep. 13:778-786. Kandasamy, K. et al. (2015). Changes in endothelial Cx43 expression inversely correlates with microvessel permeability and VE-cadherin expression in endotoxin challenged lungs. Am J Physiol Lung Cell Mol Physiol. doi: 10.1152/ajplung.00211.2014. Abel, E. V. et al. (2014). The Notch pathway is important in maintaining the cancer stem cell population in pancreatic cancer. PLoS One. 9:e91983. Ozelo, M.C. et al. (2014). Omental implantation of BOECs in hemophilia dogs results in circulating FVIII antigen and a complex immune response. Blood. 123:4045-4053. Rossello, R.A. et al. (2013). Mammalian Genes Induce Partially Reprogrammed Pluripotent Stem Cells in Non-Mammalian Vertebrate and Invertebrate Species. eLife Sci. 2:e00036 (#LTV-201).